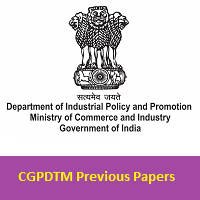 Download the CGPDTM Previous Papers from this article. The board members of Controller General Of Patents, Designs & Trade Marks (CGPDTM) had released the notification to fill the various Examiners Of Patents & Designs posts. To hire the talented, merit, skillful, capable, and suitable applicants, the officials are planning to conduct the exam on the given date under Department of Industrial Policy & Promotion (Government of India Ministry of Commerce & Industry). There is a lot of time for better preparation. So, collect the dipp.nic.in Old Papers, and start your preparation as soon as possible. To get the excellent marks in the Examiners Of Patents & Designs exam, aspirants need to practice more Controller General Of Patents, Designs & Trade Marks (CGPDTM) Sample Papers. Competitors can get the detailed information on dipp.nic.in Exam Pattern 2019, and CGPDTM Selection Process. Check the Exam Pattern before going to attend for the examination. Moreover, it is essential for the competitors to check the Structure of the पेटेंट, डिजाइन और व्यापार चिह्न के नियंत्रक जनर Examination 2019 to make your preparation perfect. And the examination will be held at various centers. The Prelims Exam will be an OMR (Optical Mark Reader) based Multiple Choice Question (MCQ) Paper with one correct Answer out of four choices, i.e., A to D. This paper will be of 2 hours duration with 150 Questions of 1 Mark each, to the maximum of 150 marks. The question Papers consists of 5 sections that hold 30 questions, which will be given in General English, General Science, Verbal and Non-Verbal Reasoning, Quantitative Aptitude and General Knowledge & Current Affairs. Moreover, there will be no Sectional Cut-offs, in this Exam. However, there will be a negative marking @ 33% for wrong answers. This paper will be a Screening Exam only. The Mains Examination will have two Papers namely Mains Exam Paper-I and Mains Exam Paper-II. Mains Exam Paper I: This will be a descriptive Question Paper of the concerned Discipline or the Subject opted by the candidate. The Mains Question Paper shall be of 3 hours duration and shall have a maximum of 300 marks. The question shall be designed to test the knowledge of the subject. The candidate will be provided with Answer Booklet with sufficient pages to answer all questions. No electronic gadgets except battery operated scientific calculator shall be authorized. If required, Log Tables within the question paper shall be provided. Mains Exam Paper II: It will be an English Proficiency Question Paper. This paper shall be of 1-hour duration and shall have a maximum of 100 marks. This test is designed to test the English Writing, Power of Expression & Report Writing Skills or the Ability of the candidates. This paper will be qualifying in nature and will comprise of Questions based on Comprehension, Short Essay, Usage & Vocabulary, Report Writing and Precis Writing. This Mains Examination will be the Qualifying Examination. We suggest you start your preparation with the help of these CGPDTM Previous Papers. You can also leave your comment in the below section of our Sarkari Recruitment webpage for any query.